The Sing It! Festival, hosted by Friends University, was held on Thursday, February 9. Choirs from six Kansas high schools (Northfield, Buhler, Goddard, Nickerson, Chaparral, and Macksville), along with choirs from two Kansas community colleges (Cowley and Dodge City) and groups from Friends University attended the event. In the afternoon, each choir received an individual clinic with Mr. Nuñez, performing two selections of their own for the evening concert, prior to the mass choir performance. The Cowley College Concert Choir performed “The Eyes of All Wait Upon Thee” by Jean Berger, and “Wanting Memories” by Ysaye Barnwell. To view video recordings of the Concert Choir’s performance of these two works, you can go to the Cowley College Music Facebook page: https://www.facebook.com/cowleymusic/. To view video recordings of the mass choir performance, go to the Friends University Concert Choir Facebook page: https://www.facebook.com/friendsuniversityconcertchoir/. Along with the afternoon choral clinics, each group received a campus tour of Friends University, and participated in a vocal jazz clinic with Craig Curry, and a vocal masterclass with Dr. Holly Schwartzendruber, both faculty members from Friends’ music department. Each school provided two students for the masterclass. The Cowley students who participated in this activity were Jennifer Guzman and Allie Lawrence. 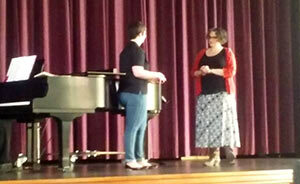 Guzman won runner-up in the masterclass competition and performed her solo during the evening concert.